Mook Sea Farm depends on seawater from the Gulf of Maine pumped into a Quonset hut-style building where tiny oysters are grown in tanks. Mook sells these tiny oysters to other oyster farmers or transfers them to his oyster farm on the Damariscotta River where they grow large enough to sell to restaurants and markets on the East Coast. Bill Mook scoops up a handful of tiny oysters from a bucket in his hatchery. Photos are screenshots taken from a University of New Hampshire video about the "black box" project. The global ocean has soaked up one third of human-caused carbon dioxide (CO2) emissions since the start of the Industrial Era, increasing the CO2 and acidity of seawater. Increased seawater acidity reduces available carbonate, the building blocks used by shellfish to grow their shells. Rain washing fertilizer and other nutrients into nearshore waters can also increase ocean acidity. 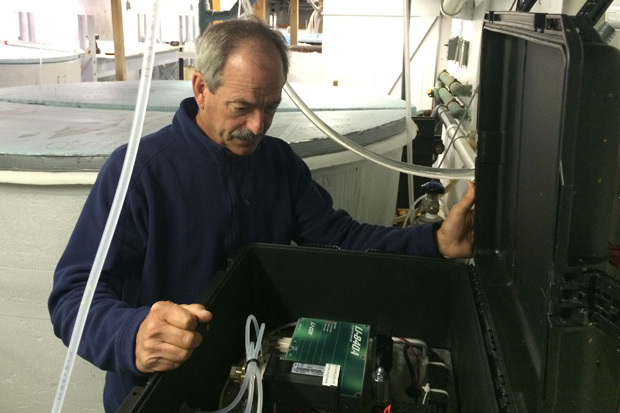 Bill Mook, owner of Mook Sea Farm on the coast of Maine, checks sensors inside the "black box," which monitors the changing acidity in seawater that he pumps into his oyster hatchery. Photo courtesy of Bill Mook. 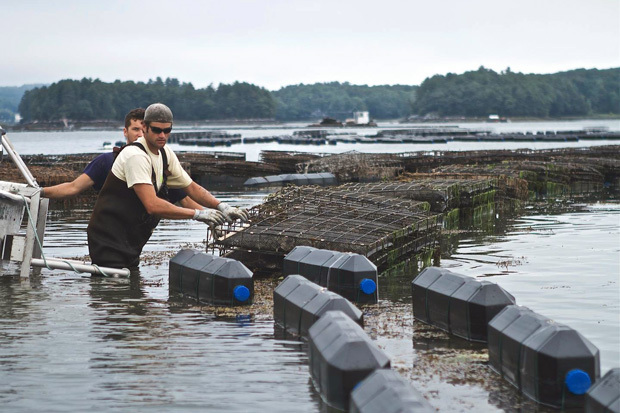 Shellfish farmers check cages in the Damariscotta River, where Mook Sea Farm grows oysters for market and restaurants. Photo courtesy of Bill Mook. “We see a growth opportunity for this equipment,” Salisbury says. He and his team are now using “black boxes” in the waters off Puerto Rico to map where changes in acidity may contribute to coral reef erosion. Starting this year, NOAA Ship Henry B. Bigelow will be outfitted with black boxes to collect carbonate chemistry data during fisheries surveys along the eastern seaboard. NOAA will use this data to help improve predictions of how ocean acidification may affect valuable resources and the people, like Mook, whose livelihoods depend on them.